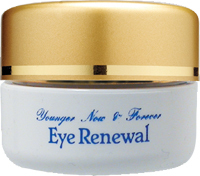 Potent botanicals & hyaluronic acid combine for younger looking eyes! The delicate skin around the eyes and even the upper lip drinks up this extra-rich formula which penetrates deep into the epidermis, allowing hyaluronic acid to absorb up to 1000 times its weight in water to plump away fine lines today – and promote healthier looking skin for tomorrow. Potent and exotic botanicals from around the world help alleviate age lines, under-eye bags and dark circles. Use nightly for best results. Apply gently with fingertip under and around the eyes and upper lip before retiring each night.